In the fall of 1986, when I was a piano major at The University of Tampa and lived in the ground floor apartment of an old house in the quaint Tampa neighborhood of Hyde Park a few blocks from the bay, I acquired two beautiful portraits of Brahms which have hung on walls in my living and working spaces ever since. The first was a poster I saw in the window at Patelson’s. 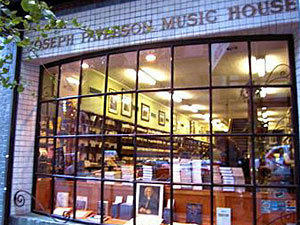 In October of 1986 I went to New York City for a long weekend, and like any other classical musician who visited New York back then, my trip included a visit to Joseph Patelson Music House. For kids too young to remember, Patelson’s was the legendary sheet music store of the western hemisphere, on West 56th Street in Manhattan across the street from the stage door of Carnegie Hall. Patelson’s closed in 2009, and is worth at least an entire article all its own….but back to Brahms. 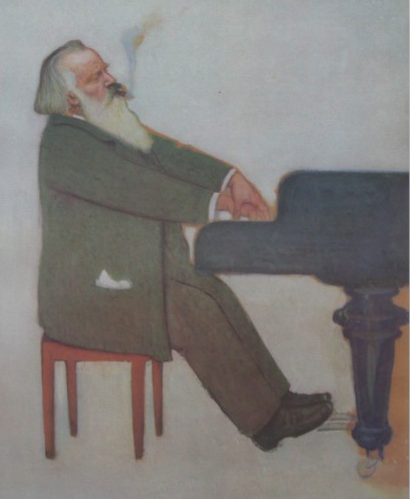 As I entered the store from the street I glanced over the items in the window and noticed a large poster – a painting of Brahms in profile, playing the piano with a cigar in his mouth. Some quality of the painting struck me immediately – the intensity of Brahms’ absorption in his own music making? The seeming paradox of the nonchalance with which he holds a lit cigar between his teeth while he plays? The fact that the turns carved in the front leg of the piano depicted in the portrait were nearly identical to those on the legs of the Rudolph Ibach Sohn grand piano sitting in the living room of my apartment in Tampa? I inquired if the poster was for sale, and the kind clerk at Patelson’s took it out of the window, rolled it up, found a cardboard tube to put it in, and I took it home to Tampa, along with several heavy orchestral scores and volumes of piano music. For more than 30 years, this portrait has hung over my piano at home, and still does today. 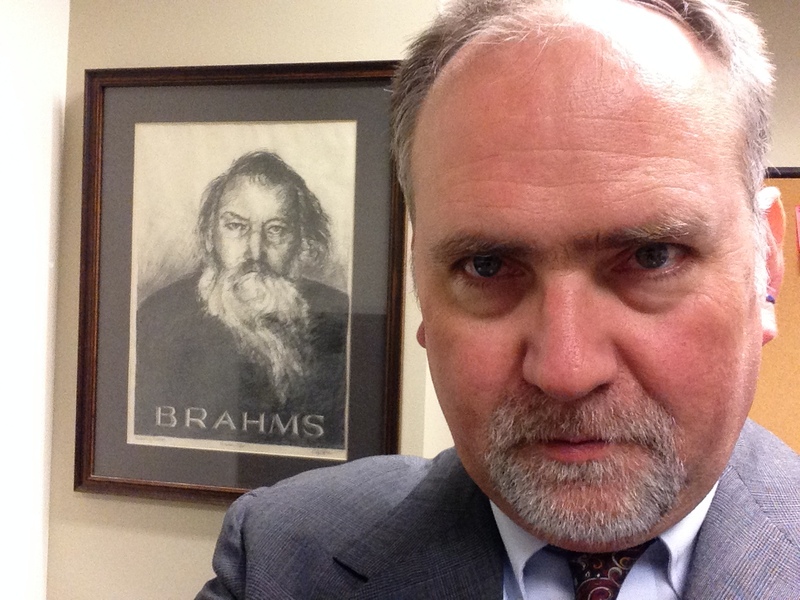 in my office at the Nashville Symphony, December 10, 2014 ~ Carol-Margaret’s portrait of Brahms peering over my right shoulder. Brahms’ eyes in this portrait seem to follow you around the room. Over the years, many students told me that no matter where they sat in my classroom, he was always staring at them! The second portrait is a pencil drawing that arrived in the mail the following month, also rolled into a cardboard tube. This portrait was a gift for my 21st birthday, and was drawn by my immensely talented and thoughtful sister Carol-Margaret. She drew it from the photo plate facing the title page of my Henle edition of Brahms late piano works. Of all the pieces of music iconography I own, this portrait is the most precious to me. For many years, it also hung on the wall at home (there is an accompanying portrait of Beethoven she drew for me a few years later, now in my son’s “temporary” possession), but after I moved to Nashville I took it to school and hung it behind my desk. Brahms looked out at my students from behind my back in the piano studio at Nashville School of the Arts, and later in the choir room. Students in Madrigal Singers at NSA during the fall and winter of 2012-13 remarked to me a number of times about the experience of singing Brahms’ music under his gaze, as we rehearsed the first set of Liebeslieder Waltzes that year. Apparently it was sometimes an unsettling experience, as if some stern or exacting quality of the man emanated from the portrait watching them rehearse, intimidating them and silently demanding their very best efforts. After I left NSA and began to work for the Nashville Symphony, I hung it on the wall in my office at the Schermerhorn, and now Brahms observes every conversation I have across my desk. Do you love Music? Brahms did. He gave up all other pursuits or happiness and dedicated his entire life to Music. He never married, dying a bachelor little more than a month shy of his 64th birthday. Music rewarded him with the inspiration and the discipline to create a vast catalog of some of the most beloved works in the Western canon. I first became enamored of Brahms in my late teens. When I was 17, my piano teacher Gary Davenport played the Intermezzo, Op. 118, No. 2 in A Major for me after a lesson. I was captivated. Like so many pianists before me, I soon acquired the Henle edition I mentioned above and learned to play it too – that Intermezzo was the first piece of many by Brahms that I learned to play. His music – piano pieces, lieder, choral, chamber, and orchestral works – has accompanied me throughout my life, a constant like an old friend who might crop up unexpectedly any day now, with a knowing look on his face – an easy companion I can be candid and honest with, and who will be the same with me. His music balances a deep wisdom, compassion, and empathy with wry humor and a perspective that seems to take into account the grand sweep of history and the natural world. So much of his music is as or more beautiful than any other I have encountered. That Henle edition has been falling apart for years now, I will need to replace it soon. By walterbitner in Choral, Education, Music, Music Education on May 7, 2017 . So beautiful! Among my Brahms thrills in choral music – conducting the Brahms Requiem, and from it, “How Lovely is Thy Dwelling Place.” I’ve probably done it with choirs 30 times over the years, and it never fails to inspire. And then there is the augmented fugue in the motet, “Create in Me, a Clean Heart.” What genius! Thank you, Walter, for bringing these treasures alive in my mind this morning! Wie Lieblich Sind Die Wohnungen is also one of my very favorites! I’m going to dig up my recording of that motet now, thanks Pam! 🙂 Nice; I’m so glad you still enjoy that portrait. Funny, I was listening to Brahms on classical archives yesterday…. Ah, Patelson’s! What a loss that was, a place you could actually browse through sheet music.